Since 1996, Delta Chi has been improving the college experience for undergraduates. As the newest men’s social fraternity on campus, it’s founders looked upon Kettering’s Greek system with the goal of creating a higher standard for Greek life. They did so by creating a fraternity chapter steeped in tradition and a mindset of redefining the college social fraternity. From our LAN party to cookouts, our members keep fun in mind. We believe that a fraternity is built on events members want to go to, not events they’re made to go to. As such, we don’t penalize our members for not being able to attend all events. We believe that you get out of your fraternity experience what you put into it. In addition to our creative events, our members are committed to staying involved on campus and in the community. Our members are involved in wide variety of clubs and organizations on camps. We give back to the community through volunteering at local soup kitchens as well as hosting other philanthropic events. 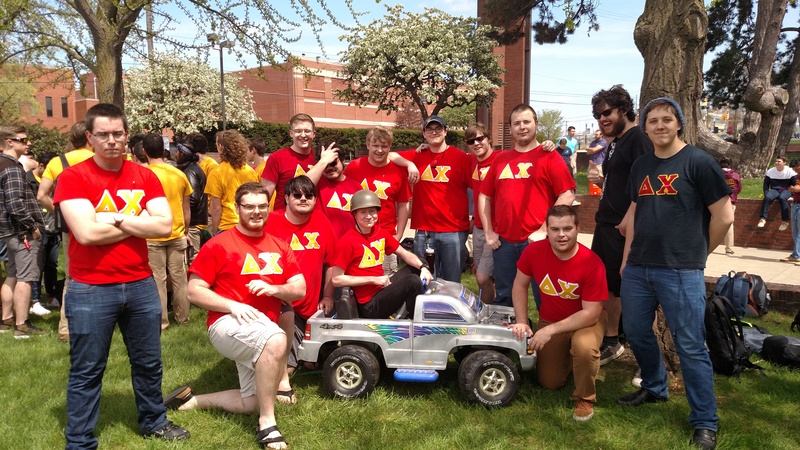 The Delta Chi Fraternity raises money for the V Foundation to support cancer research, and the Kettering-A chapter is one the largest contributing chapters in the country. When our members aren’t busy working to redefine the fraternity experience, they’re studying hard and have helped make our chapters GPA one of the highest on campus. Be sure to stop by our house and join in at our events to see what we’re all about!